CryptoKitties and Gods Unchained have teamed up for a very special partnership – one that will see crossover special-edition digital items added to both games. From January 10th to 28th, head over to Gods Unchained and buy a "Cat in a Pack" item. 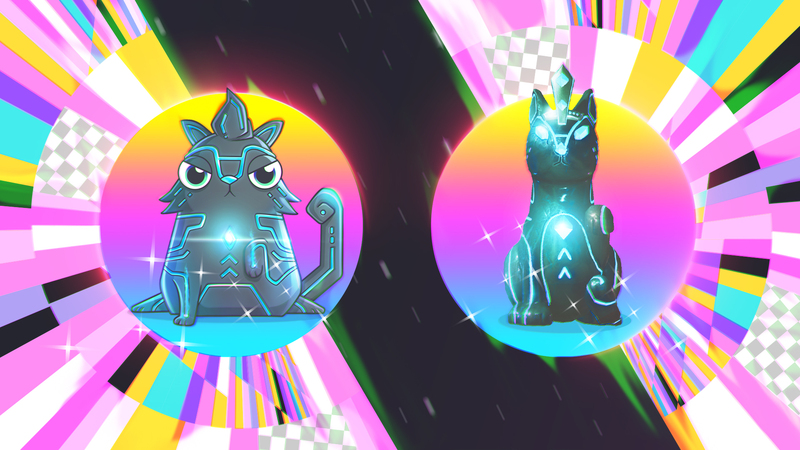 For every Cat in a Pack you own, you can import one of your CryptoKitties to Gods Unchained and turn it into a mystical Cat Talisman! This talisman is a special card that will be available to use as soon as the Gods Unchained beta opens to the public. Your deck will purrocious! Speaking of… Unlocking our newest Fancy Cat, Tally the Purrocious, and bringing it into Gods Unchained instead of a regular Kitty will give you access to a special, even more powerful version of the Mystical Cat Talisman item. But how do you get your own Tally the Purrocious? CryptoKitties is, at its heart, a breeding game. If you fancy yourself an explorer, you can breed any two cats together and wait to see what their child will look like. But when you're trying to breed a specific Kitty – and, in the case of Tally, get in on a super cool new angle of the game — you need to be a little more like a scientist. So today we're going to teach you how to breed the Fancy Cat of your dreams. Tally the Purrocious is only available to breed from January 10th to 21st, so don't waste any time! Every CryptoKitties has a set of genes. Some of them are visible, and we call them Cattributes. Some, like the secrets of the Titans, are hidden. When you breed two Kitties together, their children will end up with a mix of different genes. To make a Tally the Purrocious, you'll need to create a kitten with a specific set of Cattributes. Simple so far! You could just buy two Tally Cats and breed them together, which is the easiest way to get a new Tally the Purrocious. But it's not the most fun or challenging method, and it can be a little pricey. Instead, why not find two parents who have all the Cattributes you need between them, and pray to those Unchained Gods for a little luck! Every cat has a certain percentage chance of passing its genes onto its offspring. The math can get pretty complicated, so we recommend CKBox to help you figure it out. It's a Google Chrome extension that tells you the percentage chance each parent has to pass on each of their genes to their kitten. If you don't already own Kitties with the Cattributes you need, don't worry! You can use the marketplace to find a Kitty with the right Cattributes, and then either buy that Kitty, or breed with it. Let's breed a Tally the Purrocious from scratch! Our first step is to search our Kitties and the marketplace for Kitties that have any two or three of the four required traits. For example, you can buy one cat with selkirk, koala, and arcreactor. Now we need a Kitty that at least has the sully Cattribute to continue the example. You can buy this second cat, or you can find one for Sire on the Siring marketplace and breed with it one time. To maximize your chances of breeding Tally, try to find a second cat that has a mix of some of the other Cattributes, too. For example, you could go for a selkirk, koala, and sully, or koala, arcreactor, and sully! This is when you check what your chances of passing on each of the required Cattributes are; the CK Box extension will show you that info in a drop-down menu on the breeding screen. You can click each required Cattribute for a Fancy recipe to see your overall chance of hitting all of them in one breed. 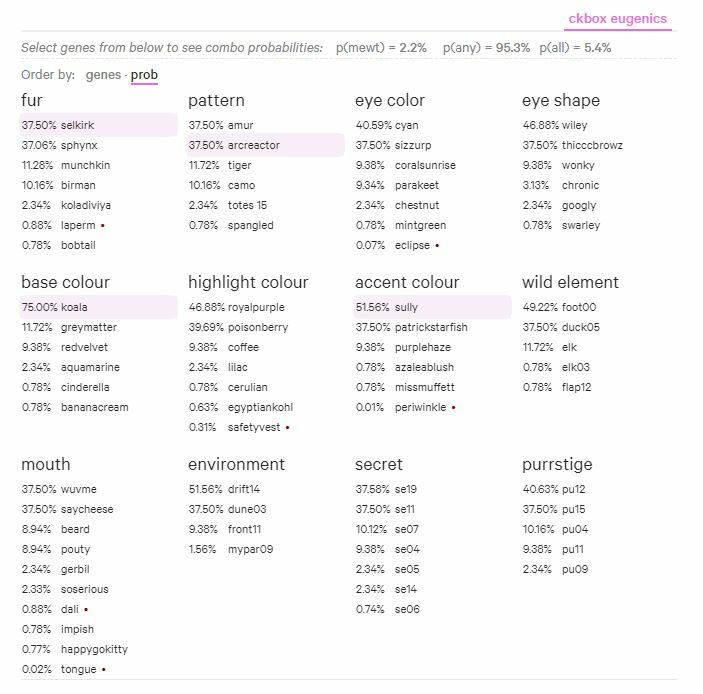 In the example above, we have a 5.4% chance to hit all the traits needed for Tally the Purrocious. It's not high, but it's better than nothing. And even if we don't breed a Tally Cat this time, we might breed a Kitty that has two or three of the required traits, which we can then pair up to try and breed our target Fancy again. It often takes a bunch of breeds, or a lot of good luck, to breed a Fancy. But the more you do it, the better you get, because you'll have more Kitties and a better sense of how to find the best breeding pairs. So go on, get breeding. And good luck! Your new Gods Unchained-themed Kitty awaits.